Rev your engines for the ride of your life! The larger-than-life sport that always leaves you entertained is returning to the UK on 4 May 2019 to deliver unexpected, unscripted and unforgettable entertainment for the entire family. 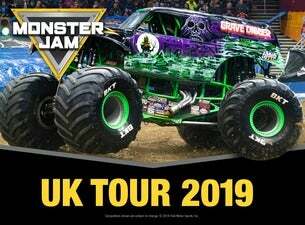 Monster Jam takes centre stage in the world’s most iconic venues, sporting meticulously manicured dirt tracks created with the sole purpose of pushing these perfectly engineered, ever-evolving trucks to the limit. This adrenaline charged, non-stop action motorsports spectacular is set to be more jaw dropping than ever before. Champion drivers push themselves to their limits in both championship racing and gravity-defying freestyle competitions to fuel fans with an adrenaline rush like never before. Combining high-octane, spontaneous stunts with the ultimate off-road motorsport competition, fans will witness the unexpected and the unforgettable.